This post was originally published on July 14, 2009. It was substantially revised and re-posted on December 21, 2015. It’s a tailored choice that brings to mind the sea. Thanks to Photoquilty for suggesting Maren as our Baby Name of the Day. For every Arabella, there’s a Gertrude. Maren occupies the middle ground – feminine, but frills-free. It’s not quite as gender neutral as Sutton, but it’s also not as obviously meant for a girl as Lucinda. This makes it a great compromise name for parents torn between Alena and Sloane. It could come from the Latin marinus – of the sea, via the Roman family name Marinus and the feminine Marina. It could also be short for Emerentia, from the Latin emeritus, a title originally bestowed on retired soldiers but now found mainly in academia. It’s tempting to connect Maren to Mary, and it appears that it is occasionally used a nickname for Maria in German. The French word for sailor is marin, from the Latin. Marin County, California sits across the Golden Gate Bridge from San Francisco. The county might be named after Chief Marin of the Miwok Tribe, or perhaps it’s taken from a name once used for a local bay, Bahía de Nuestra Señora del Rosario la Marinera. 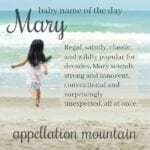 This makes it a Marian name, but just as much connected to the sea. 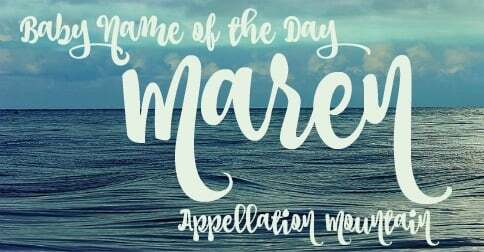 In France, it’s the name of the southeasterly winds off the Gulf of Lion. All of this makes the name gender neutral, and also suggests multiple pronunciations. I tend to rhyme Maren with Karen, but Marin County sounds more like Corinne. The ‘e’ spelling is slightly more common in the US. The original Battlestar Galactica cast included an actress named Maren Jensen, and the name briefly charted in the US Top 1000 between 1979 and 1982. Then it disappeared, only to rise again in the last decade. 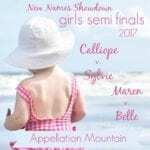 The name was given to 214 girls in 2014, down from 278 in 2008. That means Maren is currently outside of the US Top 1000. Marin was given to just 162 girls last year, but it was actually even more popular than the ‘e’ spelling. One possible reason? 2003’s Something’s Gotta Give, featuring Amanda Peet as Marin. The name charted in the US Top 1000 from 2004 through 2008, peaking with 324 newborn Marins in 2007. All of this makes Maren a choice that’s both under-the-radar and on trend. If Karen can become a Top Ten favorite in the 1950s and 60s, there’s no reason Maren couldn’t follow the same path. If your favorites range from Harper to Lily to Claire, this unexpected possibility bridges them all. It could work beautifully in the first or the middle spot. What do you think of Maren? Do you prefer the ‘e’ or the ‘i’ spelling? 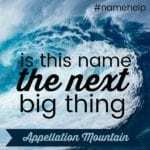 Name Help: Is This Name the Next Big Thing? As a Maren, named for my grandmother Maren, it is difinitely pronounced to ryhme with car, or mar – my Danish grandfather used to say it rhymed with barn. It is Scandinavian, and pronounced MAH-ren. The a vowel as in “Air” is not a sound used in Norse languages. It’s commonly mispronounced in the states – it doesn’t rhyme with Karen the way it is said here, but in Scandinavian sounds Karen would have the round AH vowel, too. KAH-ri, KAH-ren. I live in California and we poronounce Marin, Muh-Rin. I would pronounce Maren, Mair-en (like Karen) mostly because the Marens that I’ve met pronounced it that way… though I do like the – mar like car – pronunciation too. We spell it Maryn. But say it the same as Maren. Liked the look of it with the y. Our daughter is Maren Emily, rhyming with “car.” Never thought about it sounding like Karen even though my mom is Karen until a friend had a daughter Maren that was pronounced that way. Love the softer sound; guess it was my foreign language studies that made me hear it differently. I like Maren (mare-en) but I like Marian (mary-en) a lot more. Ma-RIN is totally unappealing. My mother’s name is Maren. She’s Norwegian and says MAHR-en. I know a Marin. She pronounces it muh-RINN. That’s my favorite pronunciation. Interesting – muh RINN is closer to the California County, I guess. I like it, too – though I’m sure it would take me a while to adjust to saying it that way. Reminds me of Murron, the character from Braveheart. 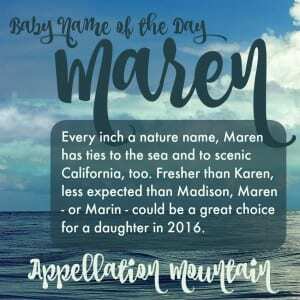 Maren is a name I’m seriously putting into consideration — My mother’s name is Karen, and my middle name is Maria, so it seems like the perfect compromise in that sense. Karina is another collaboration option, but it doesn’t seem like it includes enough of Maria — Just the i and a. If only my mother was Karina, then Marina would be the absolute perfect option! But, eh, whatever. Lovely name of the day. Really makes me think more about adding Maren to the list. Can’t wait to see more NoTDs! I went to school with a Maren (pronounced MAW-ren). She was Norwegian. I like it, though its not my style. I appreciate the fact that its a legitimate feminine name that has a masculine vibe, a far more appealing choice for those who ponder such names as Addison or Madison. I love Maren! My little brother was almost Maren, which I vastly prefer to the other top girls choice: Kendall. I also love Marina, but I love Marina a little bit more, so Marina stays! I forgot to add that I also love Marina, but hubby doesnt, and that if you spell it just a bit differntly, it’s the last name of funnyman, Marc Maron…whom I believe is Jewish. I like it! I also pronounce it to rhyme with Karen. I like it better with the E spelling, for sure. to me, Marin is pronounced ma-RIN. I don’t love that as much. It would be a contender for FBG (future baby girl) if my husband wasn’t so set in his ways. Classic names only for him! Marin sounds masculine to me, though realizing how close it is to Karen does make sense. For my taste, Marina is prettier and the “a” feminizes it more. Marin also makes me think of the character from the exorcist, though I think that was Father Merrin. I like Maren (pronounced like Karen). It has a simplicity in its two syllables and the “M” has a gentler, more feminine and maybe more exotic feel to it than Karen. Would it be wrong to suggest the (imo) adorable nn Ren?